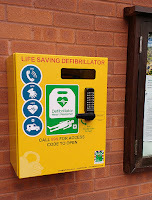 A training and awareness session on the new defibrillator has been arranged for 7.30pm on Wednesday 25th April in the Village Hall. If you would like to attend, please just drop an email to defib@maisemore-pc.org.uk and let us know how many people will be coming. A Maisemore Voneus Community Page has now been set up on Facebook with the idea that people interested in the possibility of high speed wireless broadband in the village can discuss the proposals and get updates. You can join the group here. Steve Long, who is the local 'champion' for the proposal is a moderator of the group and says, "It will enable people to talk directly to Voneus with any requests or concerns and let them communicate with us." The presentation from Voneus to the Parish Council was reported here. There is more information about the company on its website - www.voneus.com. The Parish Council welcomes any proposal that could lead to improved broadband for Maisemore residents or be of benefit to the church, but it cannot, of course, endorse any one particular commercial operation.